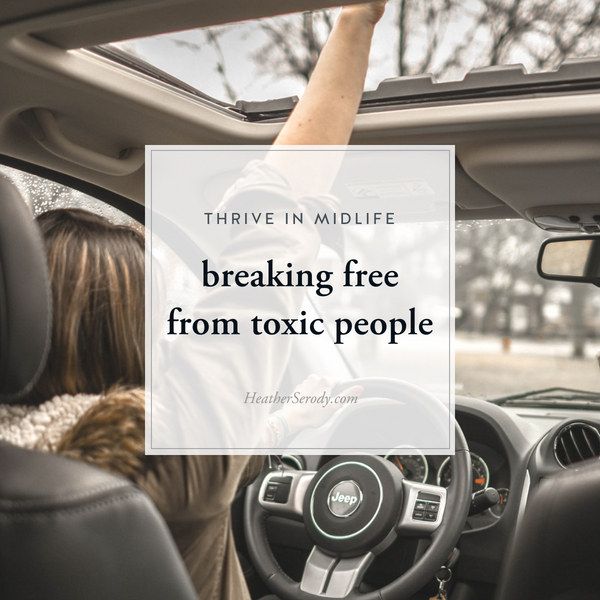 Midlife is a wake-up call to drop the futile struggle with people who make you feel bad, gaslighted (like you are crazy), and empty in the pit of your stomach. It's a time to stop trying to change them &/or waiting for them to change. I want to share with you what I've learned about breaking free from toxic people. Step one: You must create strong boundaries and stick by them. Boundaries are about what YOU will do when they are crossed, not AT ALL about the other person. But here's why it IS worth it. Enforcing your boundaries is hard to do, but once you do, you will experience a sweet self-emancipating freedom once you step beyond the pale of caring about how others judge your self-preserving actions. You realize that these relationships have no power to diminish your self-love or self-worth anymore. You know that no one can walk you to emotional liberation except the love you have for yourself and your willingness to stop allowing yourself to be abused. If you've set boundaries and yet you still feel sad, upset, gaslighted, or distraught then boundaries can’t protect you. My advice is to go no contact. Maybe just for a while or maybe forever. You've got to feel your way through this to find out what's right for you. There is no need for egoic proclamations or messy confrontations. Just move on, and leave them in the past knowing that the people in your life who are still not good for you after decades of evidence are never going to be good for you. You must stop visiting a dry well looking for sustenance from people who do not have the capacity to nourish you. Midlife is time to take full responsibility for our lives and our experiences, do the work, and invest emotionally in ourselves and relationship that DO have the capacity to make us happy, offer support and emotional nourishment. You must do this for yourself even if that means walking alone for a while. If this is the uncomfortable place you find yourself, I highly recommend reading Brené Brown's book, Braving the Wilderness: The Quest for True Belonging and the Courage to Stand Alone. This book will give you the support you need to navigate these hard choices while at the same time giving yourself the support and self-love you need. It made all the difference to me when I found myself grasping for answers. What makes breaking free from toxic people so difficult is that we must grieve what the relationship has failed to give us. Facing the reality of this can fly in the face of the stories we've told ourselves for sometimes decades about what people SHOULD be to us. The hard reality is that shoulds cannot sustain us, living in a world of shoulds is like taking a daily low dose of poison. Your energetic and emotional body cannot thrive in trying to make your relationships be what they cannot be. Grieving this fact is key to your freedom. It will set both you and the other free. Free to find nourishment elsewhere. Free to allow you and them to be who you both essentially are without judgment or shame. So grieve. And give yourself time. After you grieve (however long that takes) the work you do is to give yourself what you’ve always needed from others that they don't have the capacity to give. That’s how you get to emotional emancipation, self-actualization, & self-empowerment.